Also, see our Childrens' Page for a review of The Ghost Orchid Ghost and Other Tales. The inexplicable sound of footsteps on a roof at midnight. The apparition of a man in a white suit drowning himself over and over in a river. Ghostly whispers. A supernatural touch. A rocking chair that moves on its own. Are these the sounds and images of an old New England farmhouse? Nope. Sunny Fort Lauderdale is probably best known for being a hot spot for spring breakers, but did you know that it is also a good place to find cold spots and orbs? 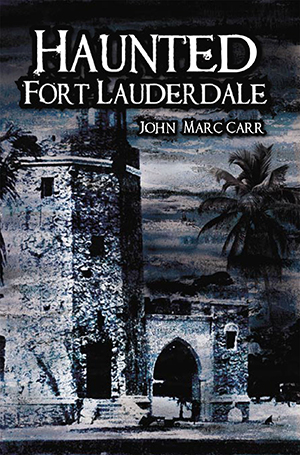 In his book Haunted Fort Lauderdale, John Marc Carr introduces his readers to numerous Fort Lauderdale ghosts. Carr, who conducts a year-round Fort Lauderdale ghost tour, founded the South East Florida Ghost Research Team and has been invited to investigate hauntings in several Broward locations. A historian as well as a ghost hunter, Carr begins each chapter explaining the background of the haunted location, then follows with reports of the alleged ghosts. Many of the spirits of Fort Lauderdale, like the locals, linger in the popular Riverwalk and Las Olas shopping, restaurant and night club district. The most haunted structure, according to Carr, is the Stranahan House, once a homestead, now a museum located right next to the Cheescake Factory on Las Olas Boulevard. The shadowy three-story riverside house, according to Carr, is home to six ghosts-all founding residents who passed away on the property. Frank Stranahan was a ferry boat captain at the turn of the century who took visitors south to Miami. His wife, Ivy Stranahan, was Fort Lauderdale's first school teacher. Carr explains that the spouses are different types of ghosts. Frank Stranahan's ghost is a "residual haunt," which is a spirit that reenacts one event over and over. Stranahan's spirit has been spotted by numerous witnesses drowning himself in the New River. Ivy Stranahan's ghost, however, is "an intelligent haunt," who can communicate with the living. "She has been known to bestow a warm feeling on those she likes," writes Carr, "and she blows in the ears of those she doesn't like—like a schoolteacher watching you cheat from behind." Another Stranahan House ghost, Ivy's brother Albert who died in his early twenties of illness, "will move objects to scare a person away" and "touch ladies in forbidden places." Many of the local bars and restaurants are haunted. The New River Inn is home to a pesky spirit who spills sugar packets on the floor, much to the irritation of the waitstaff. A male ghost occasionally manifests in an upstairs window, scowling at unsuspecting diners. At the Coyote Ugly Saloon, "a mysterious woman in Victorian clothing walks though a hallway in the back of the building." The Voodoo Lounge is haunted by a little boy who appears in the VIP room as the staff is closing up in the wee hours of the morning, and another bar is haunted by a prostitute, Maggie, who was stabbed numerous times. The spirits aren't just attached to houses and bars, though. A huge tree in a nearby park is said to be haunted by ancient Indians, and visitors to the park photograph orbs among the branches. The Henry E. Kinney Tunnel, which runs under the New River in downtown Fort Lauderdale, is said to have a ghost who occasionally disrupts traffic by appearing and disappearing in front of cars. Railroad tracks near Las Olas are said to be haunted by the many people who died trying and failing to cross the tracks before oncoming trains passed. Outside of the Las Olas/Riverwalk area, Fort Lauderdale's Fire Station #3 is visited by a young volunteer fireman who died in 1940, electrocuted by a fallen power line. Students at a dorm of one of the local universities hear unexplained footsteps on the roof. You may recall the tragic death of Norris Gaynor in 2006; he was a homeless man who was beaten to death by three teens in downtown Fort Lauderdale—the video of the beating circulated the national news. The unfortunate man's spirit is said to haunt the location of death, his energy moving in a circle as he did in his final moments of life, trying to avoid the brutal blows. I have only briefly touched on Carr's accounts of ghosts in Fort Lauderdale. Haunted Fort Lauderdale offers many more detailed descriptions. I highly recommend it. Even if you're a nonbeliever, you will learn some very interesting information about Fort Lauderdale's history. The Halloween season has once again descended upon us, and for those Floridians anxious to explore new ghost sites or just to tell stories around the fire, Greg Jenkins has returned with Volume Three of his Florida's Ghostly Legends and Haunted Folklore series. This time Jenkins investigates Pensacola in the Panhandle and several cities on the west coast, including St Petersburg and Sarasota. He concludes after his latest round of conversations with locals, historical research and even his own investigation or two that "Indeed, it seems the entire state of Florida is haunted, or as the old-timers would say ‘hainted.'" 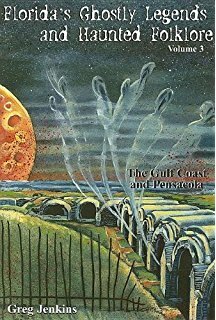 In his characteristically good-natured prose, Jenkins begins by guiding us through Pensacola's lighthouse, navy base and Fort Pickens (where Geronimo still resurfaces after his imprisonment), until he reaches Pensacola Village, "the most haunted city in Florida's Northwest." Here most of the historical buildings on its walking tour have otherworldly occupants. A hanged man and a young girl inhabit the theater, the church a "merry band of spirited monks," and the grand Dorr residence a translucent lady. Jenkins finds the wheels on a toy train spinning by mysterious hands at the Museums of Industry and Commerce. And wandering around display cases at the TT Wentworth Jr. Museum, he notes that one may hear the eerily "distinct sound of someone sighing as if terribly bored"—information they might want to keep out of their advertising brochures. Continuing down along the coast, Jenkins stops in Cedar Key, where the Island Hotel and Restaurant hosts no less than thirteen ghosts. A "caveat apparent" (a "warning spirit to those who are living foolishly") appears now and again to prom-goers driving hazardously on a dead-end road in Largo. And further south at the Vinoy Hotel in St Peterburg, a few professional baseball players, including Scott Williamson of the Boston Red Sox, have testified to waking up and finding the Lady in White standing in their hotel rooms. Any fan of the writer Jack Kerouac should make a trip to the Haslam's Book Store while in St Petersburg. In the last years of his life, Kerouac was a presence there, and not always a relaxing one: Some days he'd walk in and rearrange his books on the display shelves "as he saw fit," causing a contentious relationship with the owners. Employees in the store, as well as a psychic medium and a local ghost hunting society, all attest to feeling Kerouac's "restless and benevolent" spirit in the building. Floorboards creak throughout the store. Customers get an eerie sense they are being watched. And in the metaphysics section, Kerouac's once-favorite browsing spot, "books are reputed to fall off the shelves for seemingly no good reason." Others go so far to suggest that the store's cat, Tiptoe, refuses to go into this section at all, and at times can be seen studying the area before retreating in the other direction, as if detecting the writer's departed spirit. There are many amusing anecdotes in this book, some with modern-day props. Wesley at Rosie O'Grady's Bar and Grill keeps turning on and off the restroom faucet and electric hand dryers. Sarah Wharton, beheaded by pirates in the early 1800's, keeps fiddling with an office copy machine, "making copies of absolutely nothing: the paper exiting the machine will be pure white, black or hazy." In Clearwater's Belleview Biltmore and Spa, an antique rotary phone from the 30's keeps ringing off the hook—which would be absolutely fine, except that the old phone has no cord attached to it. Jenkins questions the Biltmore workers about the existence of the phone and gets different answers on basic facts. Some say the phone is not there anymore; others insist it still is. It is unclear whether he was able to search for it himself on the abandoned fifth floor—but it doesn't matter anyway. This is the world of haunted folklore. If there's still buzz about the phone after all these years, if "almost everyone knows about the late night ringing," that's enough to make the story true in the minds of many in the community. Although Jenkins holds a "firm belief in the reality of ghosts and spirits," he also states in the introduction that "these strange wonders of our human existence... remain in the thin ether of mythology." What intrigues me is how these myths change with their audience, and vice versa. The specter of Mary, a prostitute who hanged herself at Ringling School of Art and Design in the 1920's, had been described through the years as a skeletal apparition with rotting hair and tattered clothing. Since the 1990's, however, she "has been seen less and less as a full-bodied apparition, and more as a shady, shadowlike presence." Maybe this attests to her fading relevance to the newer generations of dorm residents. Compare this to the atmosphere of the Cracker Barrel Restaurant in Naples, where in 1995 the bodies of three employees were found in the walk-in freezer during an early morning robbery. Jenkins realizes the events at the restaurant are "still a matter of controversy and sadness for many workers there," and he approaches the topic cautiously and respectfully. He notes almost all employees "understandably" admitted general feelings of dread and uneasiness, and is therefore not surprised that many claim to experience supernatural events. Even sugar packets found scattered on the floor in the morning give cause for alarm. For the reader, this uneasiness is contagious. When a few employees attest to being trapped in the freezer and hearing "soft, nearly audible voice coming from the corner," you may not be so struck by an entertaining ghost tale, but by the shared, momentary sensation of real terror. Molly McGreevy lives in Miami FL. and is currently writing a novel involving ghosts. In 1976 and 1977, state representative Paul Nuckolls of Fort Myers introduced legislation to impose a one-year jail term and a fine on anyone who killed one of Florida's rarest animals. Was it the manatee, the wood stork or the Florida cougar? No: it was the Skunk Ape, a Bigfoot relative which has been sighted numerous times in forests and swamps across Florida. Just one of many ways Florida reacts to the many strange and mysterious creatures described in Florida's Unexpected Wildlife. The book is written to be friendly to the average reader, and so it begins with a definition of cryptozoology (the study of animals not scientifically confirmed to exist or appearing where they normally do not). It also gives a disclaimer that the book does not describe anything “supernatural,” i. e. ghosts or aliens, but instead focuses on beings that are clearly animal in nature. Florida's Unexpected Wildlife is divided into nine sections, grouped by the type of animal or its place in cryptozoology. It starts off with less surprising creatures, ones that are thought to be extinct but may still survive. I was disappointed that most of the chapter discussed the Ivory-Billed Woodpecker and its recent appearances in Arkansas as opposed to sightings in Florida. Fortunately, the story soon moves on to a more Floridian life-form, the sea monster. The book delves into a couple of specific incidents, starting with the saga of a creature that washed up near Jacksonville in 1896. It follows, in detail bordering on the unpleasant, the journey of the mysterious carcass as it travels up the beach, is cut into pieces and gets shipped off to the Smithsonian for study. The identity of the flesh is always in dispute, with academics fighting over whether it's an octopus, squid, whale, or something else, often without seeing the body itself. And there's "Old Three Toes," a creature most notable for gigantic three-toed footprints stretching over twelve inches long, which appeared on the west coast of Florida between 1948 and 1958. There were a few firsthand sightings, mostly of a large, possible furry, upright creature shaped roughly like an alligator with big feet. One theory popular at the time was that Old Three-Toes was an oversized penguin that swam up from Antarctica. Fortunately, this one was solved when in 1988 Tony Signorini came forward and showed the big iron boots he used to make the impressions; the sightings were written off as paranoia or wishful thinking. But the author is not as satisfied, citing past fake hoax claims to say that Signorini may not have been responsible for all of the occurrences. The longest chapter of the book is saved for the end, describing the Skunk Ape, Rep. Paul Nuckolls' candidate for conservation. The Ape varies in height from six to twelve feet tall, is covered in fur and gets its name from the disgusting smell of rotting eggs that follows it everywhere. Sightings of the ape began in the 1940s and multiplied rapidly, peaking in the 70s before becoming less frequent in the 80s and bouncing back in the 90s, with reports including brief glimpses, harassment of cars and trailer homes, and a view of a placid-looking Skunk Ape family. The most detailed report came in 2000, when a woman claimed a Skunk Ape had stolen apples from her back porch; she took pictures and sent them along with an anonymous letter to the Sarasota County Sheriff's Department, but despite the sheriff's best efforts her identity and that of the Ape remains a mystery. Even with all the historical information available in the main body of the book, for me the real gem of Florida's Unexpected Wildlife is the appendix. 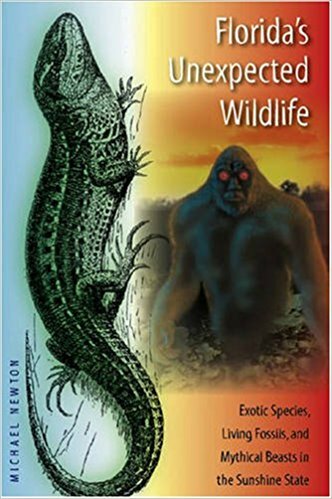 An invaluable resource for any Bigfoot fan, it compiles seventeen different resources and lists every Skunk Ape (or possible precursor) sighting in the state from July 1818 to January 2006, giving date, witnesses, location, and a brief description for over three hundred reports, although some of them are very short (“1993, unnamed, Titusville, unknown”). The book gives very specific information on the locations where unknown creatures are sighted, but nearly everything is listed by county. There is a map at the book's opening, but it doesn't have county names on it and thus isn't much help. For those of us who can't tell apart Marion, Martin and Manatee counties, a good map is a necessary tool. (Editor's note: See an online map of Florida counties here). In the end, Paul Nuckolls' bill was voted down by the state legislature, and the Skunk Ape is still not protected by law. But I'm sure if our legislators read Florida's Unexpected Wildlife they would reconsider their decision and protect not only the Skunk Ape but the many strange creatures that inhabit the Sunshine State. James Barrett-Morison is a senior at Ransom Everglades School in Coconut Grove, Florida. He is also a contributing editor of The Florida Book Review. You’re still sweating in a pair of shorts, and the lush palms sway in the humid breeze. How can you experience a spine-tingling chill the Floridian way? Greg Jenkins, an amateur ghost hunter and investigator of Florida’s folkloric history, has traveled from the Keys to Tampa to Orlando and all the way up to St Augustine to explore haunted mansions, inns, restaurants, psychiatric hospitals, cemeteries—even a Winn-Dixie supermarket. While visiting, he finds residents willing to share their community ghost stories. 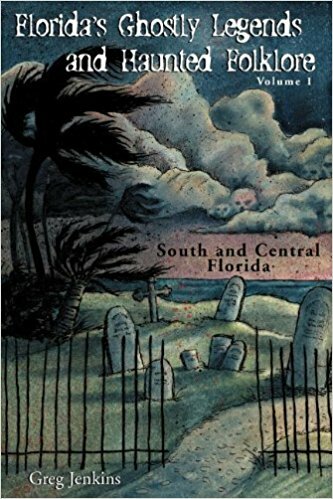 The result is an enjoyable compilation of “true” ghost tales set in two volumes: Florida's Ghostly Legends and Haunted Folklore, Volume 1: South and Central Florida and Volume 2: North Florida and St Augustine (a third volume, The Gulf Coast and Pensacola, is forthcoming next month), that help you explore for yourself the dark underbelly of our Sunshine State. And some of the tales Jenkins digs up will certainly haunt you. December, 1972. After Eastern Airline Flight 401’s fatal crash into the Everglades, a night rescue worker steers his boat towards an area where he hears loud sobbing. Peering down into the “dark waters, he saw…a bleach-white face of a man, his blank eye sockets staring up at him with his mouth opening and closing as if trying to scream.” When he turned back, there was “No survivor… no body… nothing.” To this day, on dark foggy nights, some claim the victims of this crash can be seen hulking together in groups of fifty to a hundred, a dark mass of souls searching for their way out of the swamp. The shadow people of the Sugar Mill Ruins in New Smyrna Beach are “very dark, almost black shadows that creep into dense trees at dusk and climb onto the walls and rubble,” watching the tourists who visit there. Locals believe these are the spirits of Native Americans killed in the Seminole Wars of the 1800s. Some tales call back figures from a fading past, but others include Florida’s more famous players. Henry Flagler appears from time to time in the lobby of his Hotel Ponce (now Flagler College), while strange lights flutter from its fourth floor’s mirrored suite, where his distressed mistress once hanged herself from a chandelier. Meanwhile, in his Whitehall Mansion in Palm Beach, his third wife Mary Lily smashes the heirlooms Flagler left to his children. In the Castillo de San Marcos in St Augustine, the remains of a young lady and her lover were found shackled inside a hidden dungeon, buried alive by the fort’s part-commander and jealous husband, Colonel Marti. In St. Petersburg, the real estate developer Thomas Rowe still resides at his magnificent Don CeSar hotel, appearing some days on the beachside courtyard, staring out at the sea. These and many more are lovingly written by Jenkins, who has a knack for spooky stories and a passion for local history. Each chapter is divided into three sections. “A Little History” begins with a detailed history of the locale and its people as it concerns the modern-day spirits. “Ghostly Legends and Haunted Folklore” contains the ghost narratives retold in Jenkins' own voice using interviews and hearsay from local townspeople. And the final section “Afterthoughts” gives good-humored ghost-hunting advice, such as “If… you hear a moan or low mutterings coming from an old darkened room, don’t walk out… run!” This last section sometimes offers driving directions, hotel phone numbers, and for the more scientifically-minded, suggestions about what paranormal equipment should be brought to best record the event. If you’re not sure what an EMF Detector is, you can always check it out in Appendix A: Tools of the Modern Ghosthunter. Is the old Princeton Hospital haunted? That may be hard to say for those who choose not to believe, but for the paranormal investigator… the hospital does indeed appear to be haunted. One thing is for sure, the security officers who heard voices echoing and the shaking of locked doors and the technician who saw the dead eyes staring through the restraining room’s window, they believe… wouldn’t you? You may turn your nose at such ideas, even chuckle as you accompany him doing a field test on the “tripping” seventh stair at the Casa Marina Hotel, but for me, I choose to see a man whose poetic sensibility leads him to believe the psychic energy of the “unfortunate past” must be buried alive in our present-day lives. The spirit of the past is all around us, just waiting to be noticed—if only we are willing to stop and pay attention. So read these tales. Enjoy the Florida folklore. But don’t be so sure these are yarns for your pure amusement. You never know who—or what—might be staring in your bedroom window. Jenkins might advise to close the curtains and lock your doors while reading. I did… Wouldn’t you? Molly McGreevy lives in Miami and is an MFA student at FIU. As far as she knows, there is currently no paranormal activity in her backyard. 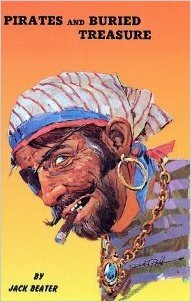 José Gaspar, born in Spain in 1756, was a pirate from the first. He started his piracy at age twelve, when he kidnapped a neighbor's daughter and held her for ransom. That thirst for piracy remained in him, despite his rise as a naval officer. When he was betrayed by a wealthy princess and a Prime Minister of Spain, his immediate instinct was to commandeer a ship and begin his notorious life of piracy. Pirates and Buried Treasure on Florida Islands tells of the exploits of Gaspar, later known as Gasparilla, and those around him. His chapter, the first and longest, is also the one that holds the rest of the book together. Nearly every one of the vignettes is tied in to him in some way, telling of islands he or his pirate mates inhabited, of those who worked with or against him, or of the treasure he may have left behind. Nothing in Pirates and Buried Treasure on Florida Islands should be taken as fact, as most of it is hearsay. The publisher inserted a note at the beginning of the book saying, “. . . the stories in this book are a mixture of historic fact, myth, and fabrication. Serious historians don't accept the exploits attributed to José Gaspar as being true and accurate, and many deny that he existed at all.” While the author, Jack Beater, who wrote this book in the 1950s and died in 1969, seems to have no doubt of Gaspar’s existence, he does caution several times that the information he gives should not be used for treasure hunting. Nevertheless, the book is still a rich resource for the history of the islands off of Florida's southwest coast. Boca Grande is central, as it was Gasparilla's primary base, but others also played a role. Sanibel was home to Henri Caesar, a black pirate who made a deal with Gasparilla: Caesar could live on Sanibel if he guarded the mouth of Pine Island Sound from the Spanish (and, later, the Americans). The book tells of the name origins of a number of these islands. Captiva was used to house rich and aristocratic women being held for ransom. Pavilion Key is named for the pavilion constructed there as the temporary home of a captive Dutchwoman, Kaaren Van Bokkelen. Useppa Island derives from Josefa Inez de Mayorga, a young Spanish aristocrat held there until her murder at Gasparilla's hand. Pirates and Buried Treasure on Florida Islands additionally offers funny historical tidbits. Two of the most famous pirates ever, Calico Jack and Anne Bonny, met in Charleston, South Carolina, and fell in love almost immediately—or, at least, Calico Jack fell in love with Anne Bonny and Anne fell in love with the pirating life. Their honeymoon cruise went awry, however, when the combination of a collapsed mast and a Gulf storm forced them to camp out on Estero Island, now known as Fort Myers Beach. This pair, probably the most disastrous couple ever to strike trade in the Caribbean and Gulf of Mexico, were the first honeymooners in southwestern Florida, long before the area became a major vacation destination. The last third of the book moves away from a historical account of the pirates' exploits and towards treasure-seeking. Beater tells stories that either happened to him or that he heard from friends, even thirdhand. One of these stories is told by a man who tried to find gold on Cayo Pelau, a small islet in Gasparilla Sound. But the island is cursed—his lunch floats away, and his boat seizes up, forcing him to paddle back to Placida. During Gasparilla's time, the island was used by the more noisy and rowdy pirates, so they could have a good time while not disturbing Gasparilla in the main camp.